For halibut, you’re going to have to use a big weight in order to hold it right there. And actually, your sinker may go in-between rocks and get locked on the bottom, so when you go back the next day to get your halibut skates, you come from the opposite [direction]; if today the water’s drifting north, and then you have to come in from the south to get it loose. 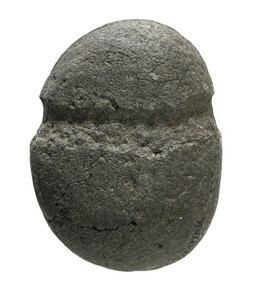 This stone fishing sinker comes from an archaeological site on Umnak Island. It has a groove for tying on a fishing line, which was traditionally made from kelp seaweed.